The Chief Executive Officer, UT Homes and UT Financial Services, Mr Ade Adebajo, has urged government to focus more attention on providing affordable housing for all Nigerians much as he called on the public to take advantage of the low cost housing which the company is embarking upon. The United Kingdom trained financial expert and property guru lamented that many Nigerians are suffering from lack of affordable housing as a result of housing deficits in the country and urged government to come to the rescue. At the foundation laying/ground breaking ceremony of the construction of 10 units of luxury and affordable bungalows named Campagne De-Maison, by the company in Mowe, Ofada, Ogun State, Adebajo said private investors have important roles in ensuring affordable housing is available to all Nigerians. “Many Nigerians are still tenants because they cannot afford to own a house. Government should do more to provide cheap and affordable houses for Nigerians as well as provide enabling environment for private investors to thrive. This is the reason UT Homes has embarked on a project of building affordable standard homes for middle and low income earners,” Adebajo said. Adebajo further said “the project, a fully furnished gated community, is the first phase of what we are doing and it will be sold within the community. We are targeting middle and low income earners. We also have provision for mortages for those who cannot pay once. There is assured security with good sewage system, constant water with excellent finishings. If we go by our projection, the first set of people will move in within the next nine months time. “So we urge Nigerians to take advantage of this opportunity and buy into this project because government cannot do it alone. It is our own little way of assisting the government. Many of the buildings are already sold out. This is a small development, we are going to do larger one. People can check our website or visit our office at Opebi, Ikeja or Sanusi Fafunwa, Victoria Island office or 09098642205, 09098642207, for a chance in a life time to own their own homes. 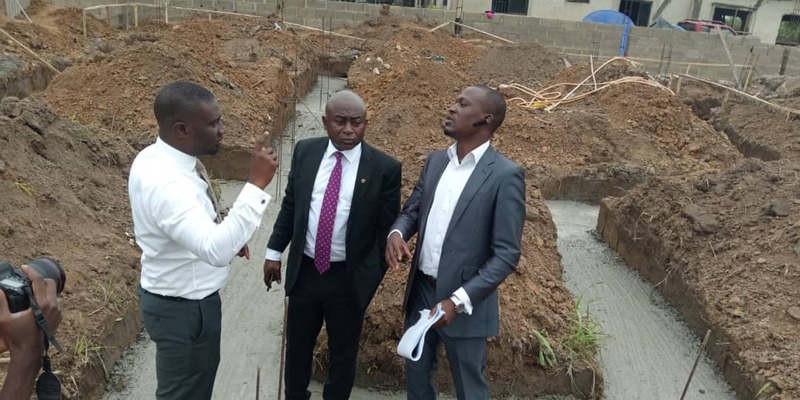 Lending credence to the authencity of the project, the company’s Project Manager, Mr. Michael Olaiya, in company of the site Engineer, promised the Nigerian public that they are in for the best of housing revolution, and hinted that it is on first come first serve basis. It would be recalled that housing for all is one of thepolicies of the present administration, and the Housing Minister, Mr. Babatunde Fashola, has remained on top of his game, putting in more efforts to see to the realisation of the quest.